Ole Kassow from Purpose Makers - and brainchild behind the Cycling Without Age movement - gave us this great shot from a street in the Østerbro neighbourhood of Copenhagen. The City has a new thing they're doing. 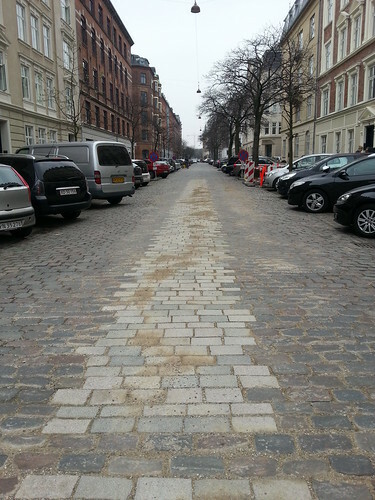 Replacing the old, bumpy cobblestones on certain streets with smooth ones. Just a strip, like down the middle on this one-way street - to make it a smoother ride for bicycle users. The city keeps a number of streets cobblestoned because of aesthetics and historical reasons. History can be a bumpy ride, though. We like how the new cobblestones are elegantly woven into the existing ones. On a street in the centre of Copenhagen, there are now smoother strips along the curbs for bicycle users to use. 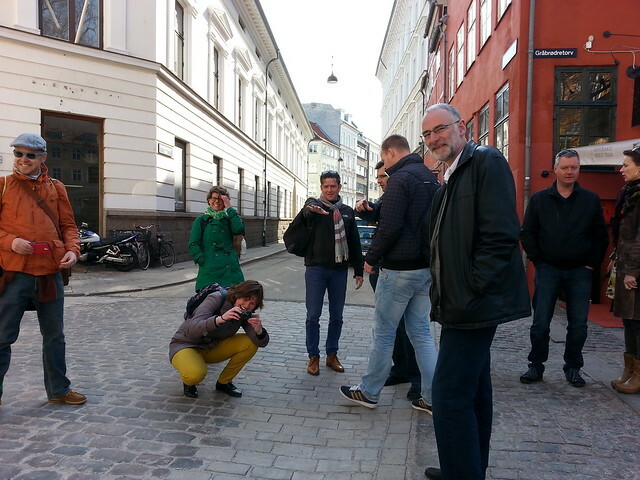 Above is a delegation from the City of Groningen, who we took on a Bicycle Urbanism tour of the city a few weeks ago. Apart from their fascination with the curb-separated cycle tracks (they filmed them in order to convince their engineers that they work... yes, they're from Groningen), these smooth cobblestone strips were an object of fascination and I had to drag them away in order to get to lunch in time. I love how even established bicycle cities can continued to be inspired by each other. There is no complete bicycle city - yet. Have a look at the street in the top photo again. 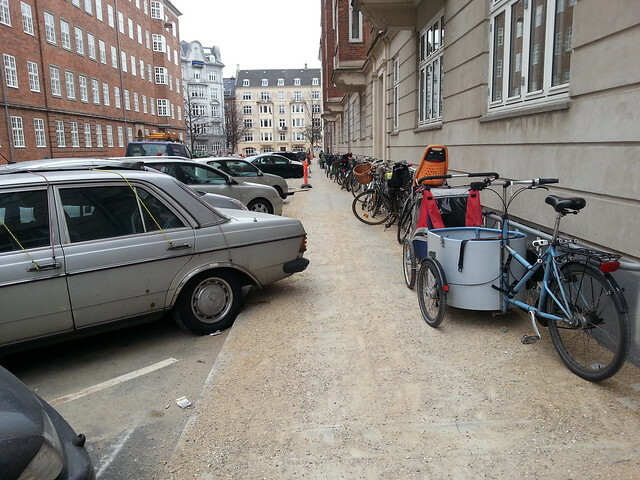 It is a one way street but it's clear that the Arrogance of Space exists even in Copenhagen. Stupidly wide street and that means the sidewalks look like this. Cars are prioritised still - at the expense of the pedestrians and bicycle users and basically everyone in the city. And this in a neighbourhood with only just over 20% car ownership.